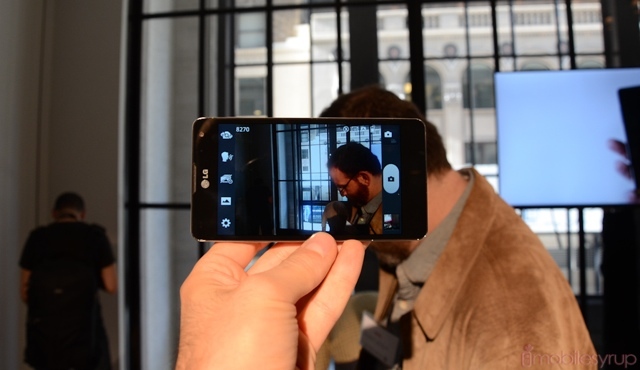 LG debuted its Optimus G “superphone” in New York at a bright-and-early event this morning, and it’s a truly impressive device. 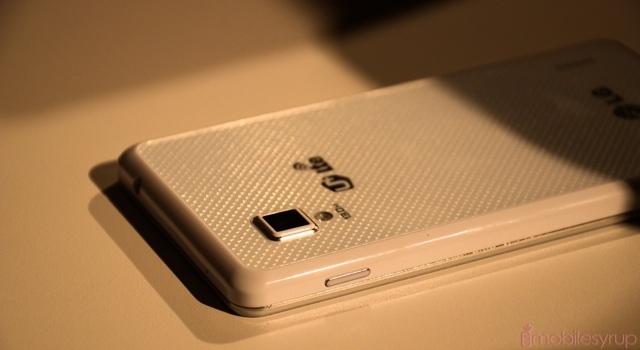 Irrespective of the gargantuan specs — and these are huge numbers — the Optimus G is a relatively compact device for its size, with an edge-to-edge 4.7-inch screen. 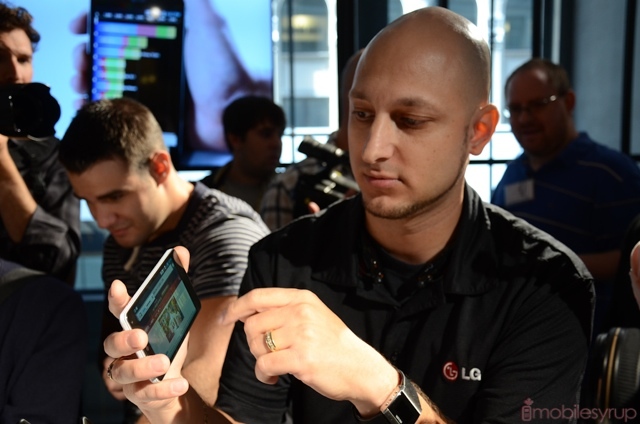 It feels more solid than any product the Korean company has made in the past, and while we’ve teased the prodigious use of superlatives LG itself used to describe the phone, we’re looking forward to its debut in Canada in Q4. 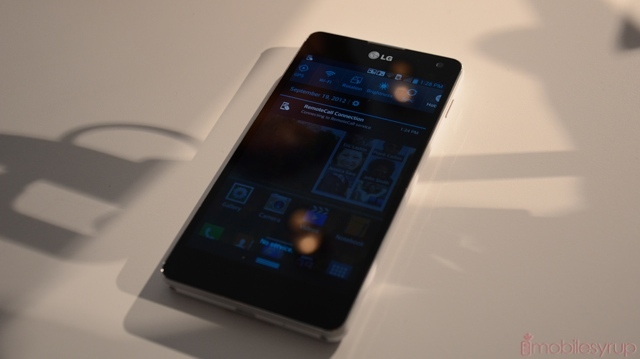 Besides the 4.7-inch 1280×768 display, which LG claims to have less gaps between the glass and LCD as well as much higher brightness and lower power consumption than AMOLED displays, there is a 1.5Ghz quad-core Qualcomm Snapdragon S4 Pro system-on-chip inside the Optimus G. There’s also 2GB of RAM standard. What this means for consumers is faster speeds in almost every area of the phone, especially when it comes to multitasking or doing processor-intensive activities in the background. To show this off, LG created Queue Slide Video, allowing users to overlay full HD video in the background while performing other tasks; you can adjust the transparency to a desired level, allowing you to continue working as you watch. The design is as simple as it gets without being boxy; the flourish derives from a superb build quality and care to add a sense of style to the sides and back. The monolithic front is almost vacant when the screen is off, and you can barely tell where the screen ends and the bezel begins. In fact, the phone’s back is one of the nicest I’ve ever seen, with a repeating prism design that glints in the light without being too distracting. 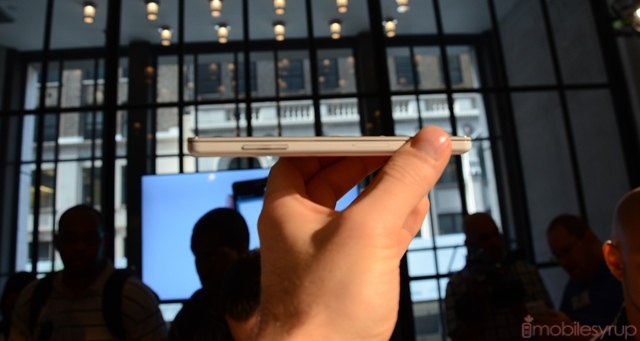 At 8.5mm, it’s not the thinnest phone on the market, but it seems like it because of the massive height and width. At 145g, it has significant weight but is easy and comfortable to operate in one hand. It seems that LG did its homework in attempting to create a device that appeals to users with a wide range of hand sizes. This phone is meant to compete. We didn’t get to test out the camera quality, but the shutter speed is about as instant as you get in the industry right now. The 13MP camera has smaller pixels than traditional models, and LG is boasting of some pretty amazing shots from this phone. 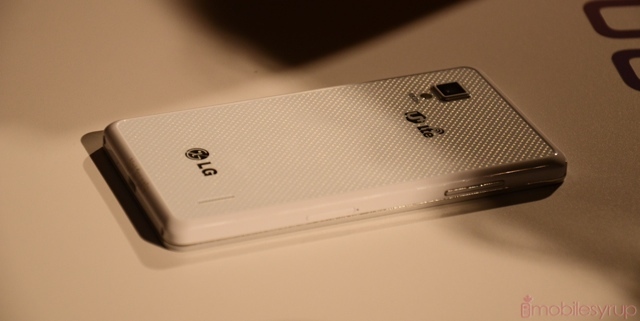 Sample photos from other sites have some great depth-of-field despite the f/2.4 lens, so the Optimus G may be the first LG device to compete with Apple, Samsung and Sony for picture quality. As for storage, there is 32GB on board and LG says that is a standard size that is unlikely to change when it crosses the pond to North America. LTE is on board as well with the separate MDM9615 baseband made on a 28nm manufacturing process. This means that the non-removable 2100mAh battery won’t be hit too hard by not having integrated LTE on the SoC; the power-sipping display will also hopefully contribute to this. 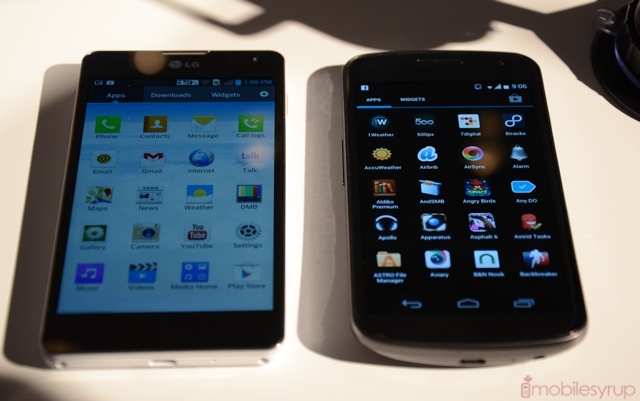 LG’s Optimus UI is running on top of Android 4.0.4, and it looks like performance is going to be fantastic despite the rather garish colour scheme. While we’d have preferred a stock Android experience, LG’s Quick Memo and Queue Slide features are quite valuable and will likely be used widely by the general population. Then again, we said the same about Face Unlock and S Voice, so your mileage may vary. 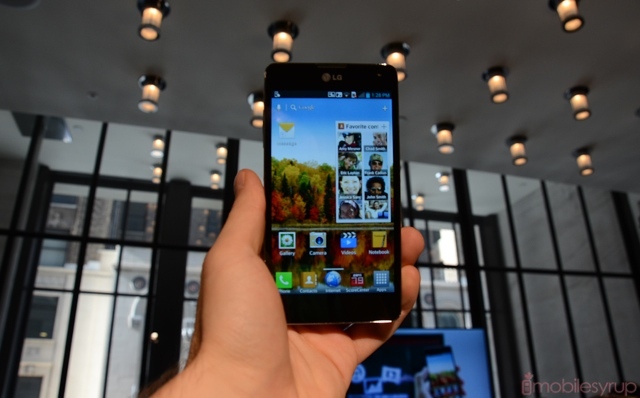 We don’t have availability of the LG Optimus G just yet for Canada, but the company says it’s coming some time in Q4. Video is currently uploading, check back later.